ZVex Basstortion Review – Best Bass Distortion Pedal? 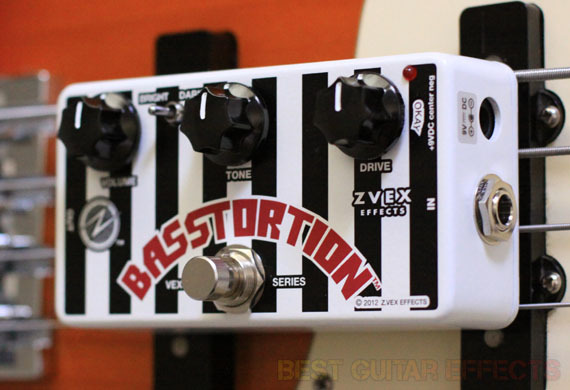 ZVex, the company responsible for famous guitar effects such as the Fat Fuzz Factory, Fuzz Factory 7, and Instant Lo-Fi Junky, went for creating the definitive tube-style bass distortion pedal with the Basstortion. This pedal is designed to offer you everything from gentle tube fatness to full on… bass-tortion! Does it live up? Is it the best bass distortion pedal out there? Read our in-depth ZVex Basstortion review to see if it’s the final word on epic bass distortion pedals. Let’s run down the features and dive in. Volume control for setting output level. Tone control for coloring your sound. Drive control for setting gain level. Bright/Dark switch for adding more high frequency content or maintaining a more tame and smooth tone. Powered by 9-Volt batter or boss-style power adapter. For more info about the Basstortion visit ZVex. I pulled out my Fender Jazz bass with Badass II Bridge and put the Basstortion between it and a clean, solid state amp setting with flat eq. With the switch set to Bright and the Drive set low, I kicked in the Basstortion and felt an instant surge of volume and warmth added to the sound. The Basstortion certainly adds plenty of lively character to your tone. I find the pedal interesting for tone-shaping as you can experiment with the Bright setting and darker Tone settings or the Dark setting with brighter Tone settings for similar, yet different colors. The controls of the Basstortion are dead simple to use. You’ll find the sound you’re looking for quickly if it is to be found here. With the drive at lower to moderate settings, this pedal makes a great overdrive. The sound is warm and musical and dynamics are ever-present. Try playing softly and digging in for a taste of the Basstortion’s growl. The Basstortion retains the dynamics of your playing exceptionally well. Pushing the Drive hard delivers plenty of distortion for most needs. You’ll hear a slight amount of hair at brighter settings, but careful adjustment of the Tone control will let you find the perfect sound. Notice how the pedal cleans up when you roll back the volume control. The most demanding bassists out there will appreciate this. Even at raging distortion settings, you of the flexibility of taming the beast at will. All in all the Basstortion is a very solid pedal. My favorite use for it is simply as an overdrive. The pedal has such a clean sound that really lets the character of your instrument come through. The Basstortion’s analog sound will certainly add some welcome life to a stagnant bass amp and work magic on your overall tone. Reviewing this little box has been a treat from our usual fare of guitar pedals only. 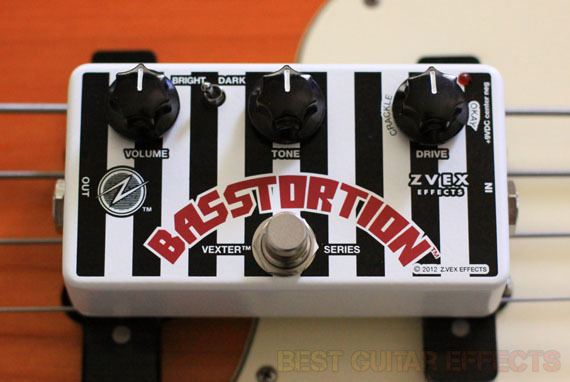 The ZVex Basstortion is a truly versatile bass distortion pedal. It will give you everything from a tube-like volume boost to a saturated low-end growl. Definitely try it as an overdrive, also. You’ll love the musically rich dynamics of the Basstortion on any setting. This may be just the pedal you’re looking for to make your bass tone come to life. 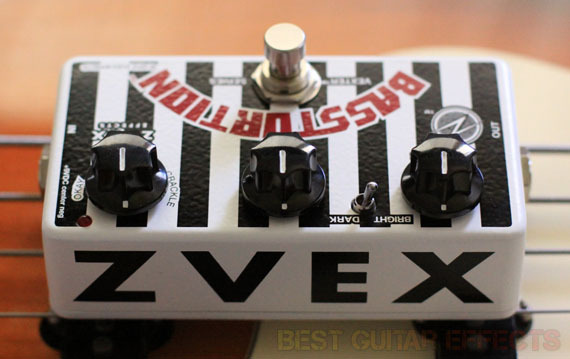 On your quest for the best bass distortion pedal, be sure to give the ZVex Basstortion an audition. That concludes our ZVex Basstortion review. Thanks for reading. Want to buy the ZVex Basstortion?